If we had everything we wanted, there would be no reason for hope. What are you hoping for this week? Or better yet, what or who are you hoping in? I have just come through an insanely busy season following the release of my book, Shame Off You and I am hoping that all of that effort helps many. But most importantly, I pray that God is glorified. My hopes often start out of a place of desire for a certain outcome. Maybe yours do, too. Then I need a little help from a friend . . . the Holy Spirit . . . the guide my hope to the right place. When my heart starts to wander in search of hopes for satisfaction, God is so kind to remind me of a hope that never fails. All the endeavors we pursue on this earth cannot compare with a hope that is absolutely certain. Our God is faithful. It is impossible for Him to not keep His promises. 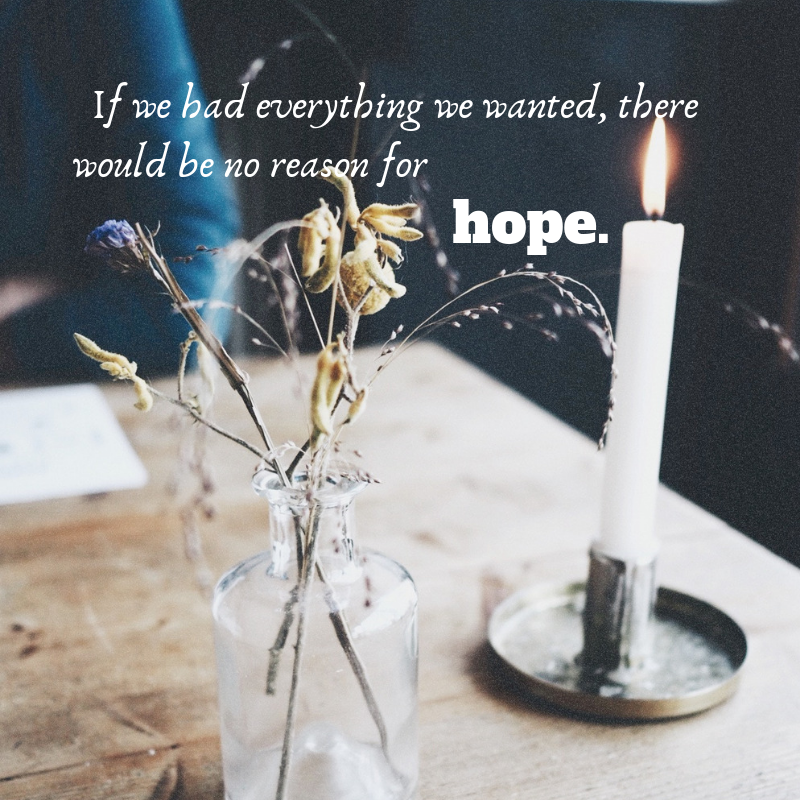 So when we turn our hopes back to the reason we hope in the first place, lesser hopes fade and we are reminded of the point of hope in the first place – to encourage us to draw near to the Author of hope. If we had everything we wanted, there would be no reason for hope. But this lack within us reminds us of our need for something greater than this life could afford – our need of God. Sometimes we need things to be clear to be able to hope in them. God did not make a promise by anything other than Himself, because there is no one greater. This chasm we feel in our souls as we yearn for something more – it was left there by our genius Creator, to remind us of our real need – our living Hope, God Himself. Come and reinvent your hope in 31 days. Hope Reinvented. Hope is waiting for you on the other side.